Beware of the Gushing Waters, Pakistan! Pakistan should gear up and take necessary precautions ! because if the history is to be trusted then south Pakistan should expect a cyclone (hurricane) to affect its coastal areas during the upcoming summer. An astonishing pattern is seen in the Arabian sea as cyclones are following a ‘schedule’ to affect southern parts of Pakistan. There are five reasons to believe that a cyclone is coming this year! Cyclones form in which month? Cyclones in the Arabian sea (see Cyclones in Pakistan) form mostly from May till June and then from September till October, monsoon season plays a vital role for the formation of cyclone in this basin. Tropical storms that hit Pakistan are mostly remnants by the time reach Pakistan or make landfall in south eastern Sindh which is not very much populated they rarely move towards the Balochistan coast. Each year before the onset of monsoon that is 15 April to 15 July and also after its withdrawal that is 15 September to 15 December, there is always a distinct possibility of the cyclonic storm to develop in the north Arabian Sea. There is a 98 per cent chance of cyclones to turn towards the Indian state of Gujarat, one per cent chance of moving towards the Gulf and one per cent chance of moving towards the Pakistani coast. Top Five Reasons to believe the cyclone is coming this summer! 1.1998 Gujarat Cyclone – A category-3 cyclone, it killed 12 people in Karachi due to heavy rainfall. It affected Pakistan indirectly. 2. 2001 India Cyclone – The third most strongest hurricane (category-3) in the Arabian sea, had winds upto 135 miles per hour. It caused 100,000 people to be evacuated from Sindh province. It affected Pakistan indirectly. 3. 2004 Cyclone ‘Onil’ – The first cyclone to be named in the north Indian ocean. Onil brought 145 mm rainfall to Thatta, caused whole drainage system to collapse in Hyderabad while nine people died in Karachi. It affected Pakistan directly as a result 300 went missing, possibly dead. 4. 2007 Cyclone ‘Gonu’ and ‘Yemyin’ – Super Gonu (category-5) was the strongest hurricane in the Arabian sea while the second strongest in the North Indian ocean, it destroyed 200 boats in Gwadar, Gonu affected the country indirectly. 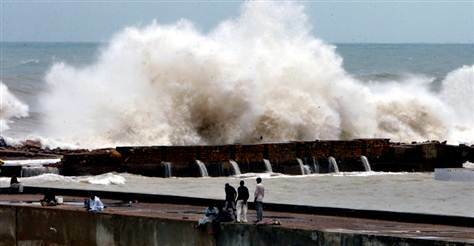 Cyclone ‘Yemyin’ killed 200 people in Karachi with week long torrential rainfall, it affected the country directly. 5. 2010 Cyclone ‘Phet’ – The second strongest hurricane (category-4) in the history of the Arabian sea, it killed 15 people in Pakistan. Most damage occurred along the Makran coast. It affected the country directly. 1998, *1999, 2000, 2001, 2002, 2003, 2004, 2005, 2006, 2007, 2008, 2009, 2010, 2011, 2012, 2013! It is quite clear that AFTER TWO YEARS there is a cyclone in the Arabian sea that affects Pakistan either directly or indirectly! Even though there were cyclones between these years but none of them affected Pakistan with the *exception of 1999 cyclone. Meteorological Forecast – Things are getting hot? 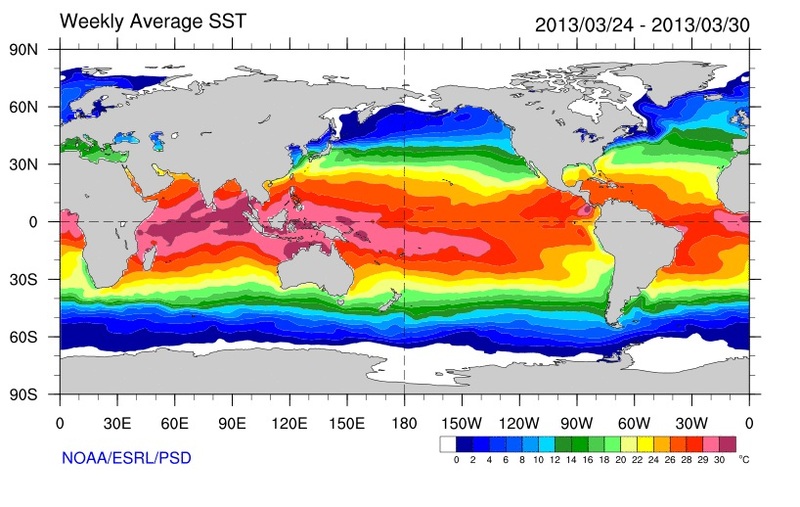 The Sea Surface Temperatures (SST) are somewhat high in the Indian ocean (both parts) as compared to other oceans. According to the map released by the U.S National Weather Service, it showed that temperatures are 29°C to 30 °C (some small pockets have above 30 °C) in the south-east Arabian sea as well as the lower Bay of Bengal. High temperatures in the south Indian ocean were responsible for a tropical disturbance that was sheared due to high vertical wind shear before further intensification during the past week. The southern parts of Bay of Bengal is also experiencing a formation of tropical thunderstorms that could be an area of interest for future forecast. As far as the Arabian sea is concerned as mentioned, the south-eastern parts have high temperatures but the northern sector (Sindh-Gujarat coast) is generally stable with 22°C to 24°C, the temperatures could increase in the coming months. So is the PWP’s “AFTER TWO YEAR MYTH” true? It is possible because cyclones are coming to Pakistan after every two years! waoo tropical cyclone. but babar bhai cyclones pakistan me ate ate rukh mor lete hain is ki kia waja hai. secondly ye zaror btaiye ga ke cycolnes ki formation ka hmare han monsoon ki intensity se koi taluq hai????? There are number of factors that block the cyclone, in short, high pressure, low pressure, wind shear and other weather system have impact on the system. Monsoon and cyclones are somewhat related. But it is not necessary that if the monsoon is strong then we shall have an active tropical season. Babar bhai this is such a disappointment! You had created hype as if something really stunning was coming up. And look what came up in the end: pretty much equivalent of khoda pahaar, nikla chouha. One doesn’t expect a report based on a coincidental pattern which is not scientifically or meteorologically proven. Quite disappointed, I am. Buddy, the fact of the matter is when you see a storm of same features (tropical) coming after every two years in the country and killing 10+ people and sometime more than 100 people then I think it is important to ‘Highlight’ that thing in a big way. We shouldnt ignore this historical fact, this article is highlighting it in the biggest way possible to create awareness!! Babar bhai i commented yesterday that this article might be based on cyclones so i m also a type of meteorologist and please tell me that when will the monsoon system hit Pakistan especially in karachi but forecasts are changed by the mighty allah. Hahahaha, it was quite understandable once the word ‘landfall’ was used, which is generally used for cyclones. Too be honest as of now, PWP is not focusing on monsoon season, in may PWP will monitor them. I also pray that no loss of life occurs, in the end its the poor who suffers, May Allah look after Pakistan! What is the updates of El nino and La nina patterns this year. One more short rain spell is coming to Karachi on Monday from west..
First time we are experiencing this rains April right ? No last year too we experienced a light rain with rough sea! But this time its going to be heavy rain. Neutral conditions are expected this year. IS IT GOING TO AFFECT ISLAMABAD. Cyclone cannot affect the northern areas including Islamabad. the cyclone is also affect multan? i was asking if remnants of it the cyclone will give isb rain. Babar Bhai tell me that cyclone will give rains to Upper Sindh Areas. Larkana, Sukkur ! on which city of pakistan would be cyclone occur? Coastal cities are mainly affected. Is Heavy rain expected in Karachi tomorrow ? Or light to moderate ? Yes, it was very heavy in the beginning, now little stable. Now the sky is completely clear. dry weather now with mostly cloudy intervals. EXCELLENT POST. HOPE THIS YEAR KARACHI WILL RECEIVE MORE RAIN. Thank you very much, hope it rains more. when will be rain will begin in multan? What is the pridiction for karachi. is this spell continue till tommorow or weeking. tez barish ho gi ya halki ho gi? written in the update post. Is that a cyclone forming in the Indian Ocean ? Cyclone Imelda in SOuth Indian ocean. there is not rainf in multan? walikum assalam – It will be uploaded in May as per schedule. Aasalamo alikum babar bhai kiya hall hai sir karachi main koi new spell aa raha hai i think 20 date ko kyun k kuch site par rain show ho rahi hai karachi main 20 ya 23 date ko kindly ap mjhe bata den plz babar bhai apk reply ka wait kar raha hun thanking you sir. Walikum assalam Ahsan – There are no chances of rain in Karachi yet. in multan is there are chances of heavy rainfall in this month? Salam Babar Bhai I found your blog last year on 17th May when a dust storm hit karachi in the evening and i was looking for the weather update on the net. I found PWP a great site for weather forecast. no chance of rain seen as of yet. here in hyderabad we are having dark thunderclouds with fast winds.. from which system they have came ? Is there any chance of thunderstorm to convert in cyclone? which formed in Oman coast. will it affect to pakistan? There are no chance of that thunderstorm converting into a cyclone. 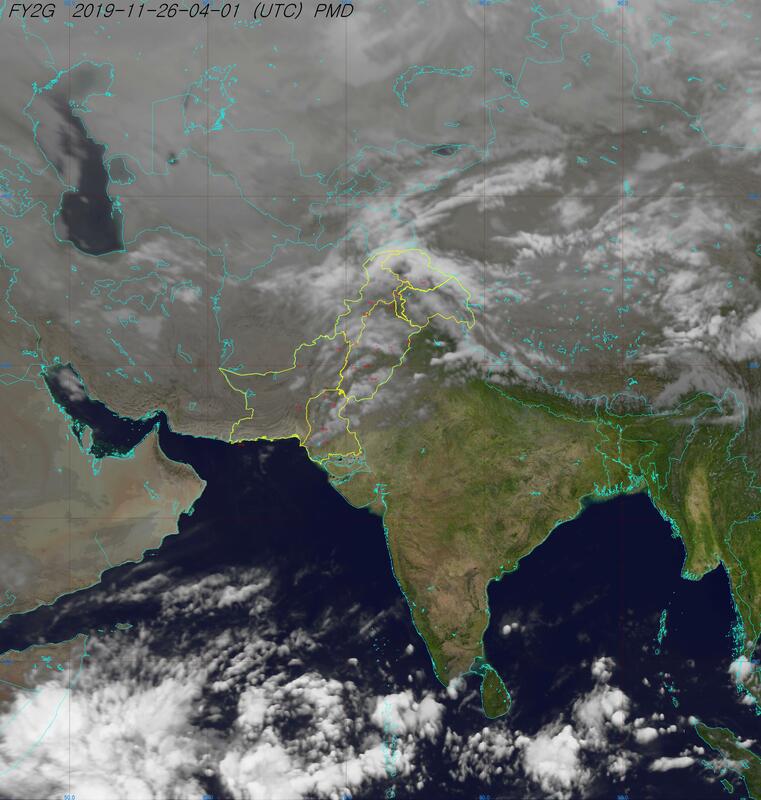 Some weak clouds passing from South Punjab. Babar bhai kab tak chances hain karachi main rain k? Walikum Assalam, Chances of drizzle persist till 24 hours. This is the last WD that is bringing rain after that it is going to be dry period till many days. Cyclone is saal Arabian Sea mein develop ho sakta hai lekin abhi kuch andaza nahi . abhi to 51% = Yes & 49% = No , yehi chances lagte hain . May ke mahine mein kuch behtar idea ho paiega . Not only will Pakistan have frequent visits from cyclones, but there is a new storm track forming in spring each year, coming from the south that goes through Arabia before it rains on Pakistan. This new storm track is what gave Arabia the heaviest rains in 25 years, last week. It rained a lot this winter season in Karachi, it seemed as if monsoon was here. Winter rains usually dissipate quick and are very and short but this time they were severe. Plz pakistan monsoon rain when will strat? No chance in Bahawalpur during the next 24 hours. any update cyclone in karachi ? aoa there is any chance of flood dis year? If you are thinking of floods like 2010 then no. Thats nice. The PWP’s cyclone myth is strong, we still have October till December.